Summary: Doctors take medical histories and enquire about family diseases. It seems like they think there are human genes behind human diseases, but when we say, “It runs in the family,” what we actually mean is our gut bacteria, microbiota, are shared with relatives along with our eating habits. Diseases result from problems with gut bacteria and not from problems with our genes. Not too many years ago, the technology for massive projects to thoroughly identify the genes behind the most prevalent human diseases became available. The results were clear and shocking. Genes were not a major contributor (less than 10%) to disease. And yet, the families studied clearly had a major predisposition to each of the diseases studied. Something was causing the disease in those families, but it just wasn’t any of the 23,000 genes identified in the human genome project. People all have essentially the same physiology determined by very similar genes. Health differences are predominantly due to gut bacteria. Commercial analysis of personal gene sequences was recently prohibited as a method of determining risk of disease, because the link between gene sequences and risk could not be substantiated. The reality is that, aside from a few obvious molecular diseases, most genetic variations in gene sequences do not matter in an otherwise healthy person. There aren’t Alzheimer’s or obesity or heart disease genes. Diet, gut microbiota, sleep and exercise are far more (>90%) important. Most genetic risk factors can be overcome by an Anti-Inflammatory Diet with fermented vegetables, and a robust gut microbiota protected from medicine/antibiotics. So if it is not human genes that run in families to make relatives share similar diseases, what is making them sick? Relatives share their eating habits and gut bacteria. This makes sense. Diet and gut microbiota are the major determinants of disease and relatives pass their bacteria around the table with their food. There are eating habits and particular patterns of gut microbiota that lead to common diseases. Unbeknownst to us, most of the diseases of modern life, e.g. heart disease, obesity, diabetes, cancer, autoimmune disease, mental illness, are transmissible by gut bacteria. For decades it has been obvious that early exposure to a farm environment, meaning an abundance of microbes, a diverse microbiota, eliminates allergies and many autoimmunities. The Hygiene Hypothesis explained how early exposure to abundant microorganisms could eliminate allergies, as an early exposure to antigens that trained the immune system. Early training of the immune system was later discounted, but the Hygiene Hypothesis then morphed into the current explanation, that early development of a diverse gut microbiota is needed to produce a healthy immune system. The good news is that all of the chronic diseases that threaten your future can be cured by just fixing your diet and repairing the complex bacterial communities in your gut. Your immune system is critical to your health and damage to your immune system is the typical beginning to most diseases. 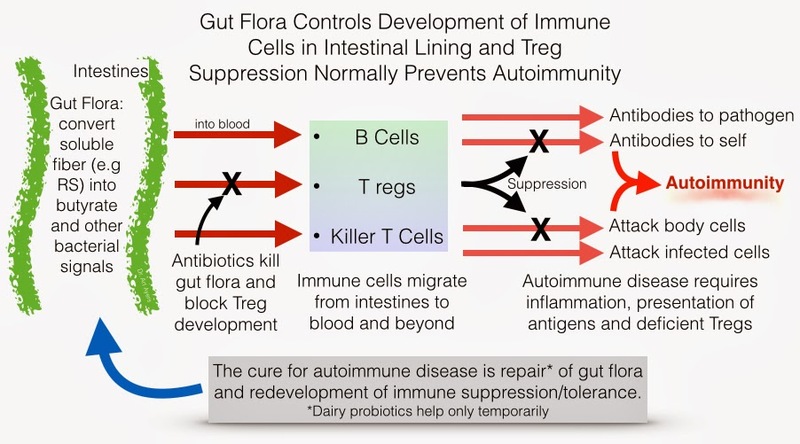 Damage to the immune system starts in the gut, where the aggressive and suppressive halves of the immune system develop in response to particular species of bacteria. 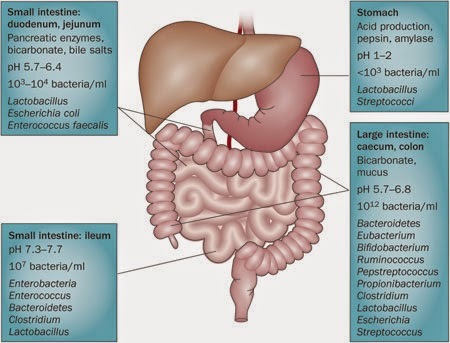 Those essential bacteria grow on the food in your diet that is not digested in the stomach and absorbed as nutrients in the small intestines, i.e. prebiotic fiber. Thus, you eat to feed yourself and your gut bacteria. Without the gut bacteria, you would be deficient in vitamins, your immune system would cease to function and you would be constipated. Fixing your diet and gut microbiota will cure your diseases.